Nanette, if I can recall correctly, the early anthrax letters were crudely milled anthrax, however the last mailings were different, some claimed them to be weapons grade. As I recall, there was some debate about whether they were in fact weapons grade. So, your point is well taken. I do remember the dog food thing too. Nanette, I just noticed some earlier questions you posted for me, I didn't mean to ignore them, I just today realized that they were there. Sorry about that, my bad. So...another way of looking at the anthrax investigation is to say that for them to focus on Hatfill or Ivins was folly because the control of the samples wasn't all that tight. Furthermore, I would think that there are still Ames spores naturally occurring, esp in Texas soil? I remember an old episode of Rawhide where the trail boss was acting as though he recognized anthrax evidence on some plants that the cattle could eat. However; I haven't read anything regarding that possibility. Now, if it was a dead cow that showed all of the symptoms/evidence, maybe that was something I missed in that particular episode of Rawhide, but I don't think so? I think you are right about the availability, TerryB. I think that everything harnessed by man has a way into the hands of men. It is evident in cases like Watergate, Filegate, Snowden, and any other whistleblowing event. If it exists, it probably can be attained. TerryB, now that you have caught up here, compare also, NJ on Anthrax return address to Scorpion letters whereby author claimed 23 victims in New Jersey. Time frames of course do not have to coincide because I do not believe all the information given at the time it is given is completely true, and Zodiac predicted if you will things that he would do. Also, compare directly the word "Building" in the fourth line of the address to the word "Building" found in the Black Dahlia postcard. The spacing, construction, and relation to the baseline are uncanny. TerryB, I don't believe I have ever seen the Goldman Sach's letter. Where did this come from, and who was it sent to? I got the thing off of the net, I assume it was received at the offices of Goldman Sachs? I have to study up on the whole Scorpion business. I have noted the forth address line habit JT had with 'Building' etc. Notice how the 'E's' are structured.The handwriting, as you well know; compares closely to the last two pages of the Ramsey ransom note, except for his little game with the 'S's' on the ransom note. I just noticed the little 'J-hook' nuance on the stem of the 'I' on WILL. The Abel Danger gentlemen have sent me an interesting article that indicates that the actual source of the anthrax might have been from places not previously mentioned by the FBI. BTW, some days I'm in too big of hurry and I'll miss certain things. Check out the two stroke letter 'I's' on the Goldman Sachs note, they were clearly intentional. One hook is at the top and the other is at the bottom. These same nuances were noted by the FBI way back during the Zodiac killer era documents. And of course, they are Zodiac Jack 101 and found on the Ramsey ransom note too. Actually, there are several of these nuances and truthfully; I'm wondering if this particular document wasn't a mimic of Jack's nuances? Kinda the the same way that I think that Jack somewhat mimicked both Patsy Ramsey's style and Karr's yearbook letter style on the Ramsey ransom note. Don't be afraid to say yea or nay on the Goldman Sachs card, Nanette. BTW, what famous case does the word 'Goldman' remind you of? What's up with that? I thought there was an interesting similarity in the attempt to made this triangle "D", so I put it together on the slide already created to see how it compares. 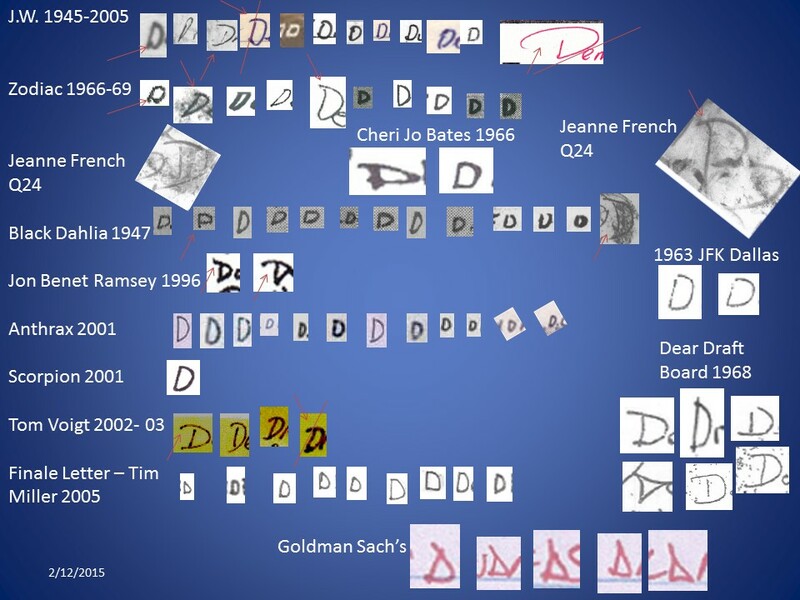 There is a hit in the Ramsey letter as you indicated TerryB, and the Dear Draft Board letters, as well as the known form of the 2 stroke "D" that we see in Black Dahlia, Jeanne French, Jack's, Tom Voigt's. If you turn the far right "D" from Goldman Sach's 1/4 turn clockwise, the form is identical to the Dear Draft Board letter, even the curved bottom(GS) compared to the curved stem on (DDB). And as we know the ciphers are breaking out messages after rotating the letters each time 1/4 turn clockwise, so it certainly fits in with the rotation game. I digress though, I am in the middle of a trial that has kept me most of the week, and I need to address some other cases. Besides, I am only to 1968, the Dear Draft Board letters, on the handwriting exam, but I thought I would throw this out there now. Where else did the FBI believe the Anthrax was from? Did I perceive something wrong, or are you correlating the Goldman Sach's letters to the Scorpion letters which in turn are related to the Anthrax letters in my honest opinion? and if so, how are you assimilating this information? Where did this letter come from? I spoke with a Dr. Omalu yesterday who was responsible for finding the dementia disease CTE and relating it to the constant and repeated blows to the heads of NFL and Boxing athletes. He said, "he was called nuts and a voodoo doctor by his peers and others in the industry because they were jealous that he found it first." The awesome thing is, is that there is now a movie being made about him, and Will Smith is playing his part. Amazing, freaking amazing I tell ya. He said just keep going forward no matter what people say, especially if you believe your work. And, yes, I see the JT nuance in "St.", also amazing. I'm starting to believe in your suggestions TerryB. They might really call me crazy now!!! It's not the FBI claiming the anthrax material was maybe foreign, they wrote that they thought the writer was a loner and was domestic. I'll re-post the article that Abel Danger sent me. As far as what I'm saying about the Goldman Sachs letter, it doesn't strike me as being in Jack's hand but I may be wrong on that? It's structure is very even and tidy, more like the Karr yearbook writing but not as fanciful. That's all that I mean by that, I'll leave the final analysis of that in your capable hands. I can't at the moment say where that letter came from, this was something I came across quite awhile ago now. It was grouped in with some of the other anthrax documents on the net. I'll poke around for it on the net. JT sure did ramp up the clues starting at the Ramsey case. I seem to have the phrase 'ramp up' in my mind a lot lately. It was the same way with the word 'hence', a word rarely used until the Ramsey case. The Brit's do favor using that word, or so it seems. BTW, check this out: 'Victory'.....maybe it doubles or triples as a reference to 'Viceroy' and 'Torries'? Just a simple notion, that's all. There's more to it than this particular story, the 'powers that be' don't want this publicized. It is Zodiac Jack 101, all the way. In the letter he did his little meta-writing game, like spellings Troxler's name Toxler, like toxic, get it? Because of the St Petersburg FL letter, I suspect that JT was trying to hint that the anthrax source was from Russia. Note the bottom hook on the 'I' in Times. Hi Nanette, I've been studying the above letter comparisons and I was struck by how close the normal D from the Ramsey note resembles the first D in the Goldman Sachs' example, like they could be laid over one another. The same goes for the first example of the 'D' in the final Tim Miller group, the Jeanne French 'D', and the the third J.W. 'D'...to name a few. I also noticed how the word 'are' in the Goldman Sachs' letter resembles the word 'Art' as 'At' does on the Ramsey note. I also can't help but notice that the word 'Art' reminds me of former clown detective Linda Arndt's last name. All of the triangle shaped 'D's' on the Sachs note, then the 4 stroke 'N's jump out there too. He really stepped up the use of little hooks on many letters on the Sachs note, which was a nuance noted in the FBI Zodiac killer files and seen on the Ramsey note too. The 1963 JFK Dallas examples seem very close to the J.W. examples overall, with the way the right face of them is a tad more flattened, yet other J.W. examples compare to several other case examples. As you know and as you have done, your Power-Point Presentation shows by totality that the documents were all done by the same author. Except now you're comparing additional case examples, which is something I really like see. Another thing that dawned on me too, is this point: Since the Goldman Sachs event didn't have actual anthrax, Jack might have felt safe enough to not attempt to disguise his own handwriting? I'm trying to figure out what his motive was in the JFK Dallas letter? Like maybe one section or vestige of the spook agencies was keeping tabs on another? Perhaps Jack wasn't included in the JFK murder and wanted to pipe in that he knew who was involved in it? Kinda the same way he seems to fit into the Cooper caper, although, he does seems to have more intimate knowledge of the Cooper caper, than he did about JFK. BTW, that Jay Epstein article must have been demoralizing for some FBI agents? Hell, maybe it boosted FBI funding? If I am to believe the very solves that are coming from the Zodiac letters, there is intimate knowledge of route changes for JFK, DOA, those involved, and a few other tidbits of info. As if to say that he was holding information ransom over someone which is why Zodiac Killer was labeled as an "Extortion" case, and not a serial killing case. Go figure! I really haven't paid much more attention to the Sach's document. I still need the time frame for it, and I'm barely to 1968 on writings. TerryB, I merged to the two Anthrax threads so that we don't have many threads getting away from us, so from now on we will address any Anthrax info here.